Above: NEHTA chief executive, Peter Fleming, speaks at the 2011 Health Informatics Conference. 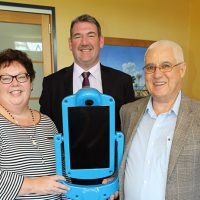 The National E-Health Transition Authority (NEHTA) announced last week it had executed contracts with five aged care software makers to form a vendor panel that will support and encourage the introduction of personally controlled electronic health records (PCEHR) across the sector. The members of the vendor panel are AutumnCare, iCare, Leecare, EOS Technologies (part of the Silver Chain group) and Database Consultants Australia. NEHTA CEO, Peter Fleming, said the panel’s primary aim would be driving the uptake of the PCEHR among residential and community aged care providers. The panel members will not only be working to adapt their own software, but to make sure the lessons they learn are “captured and disseminated broadly and equitably to all vendors and providers throughout the aged care sector”, according to Aged Care Industry Information Technology Council (ACIITC) chair, Suri Ramanathan. “We have a team of people … to manage, lead, coordinate and collaborate with all these parties,” Mr Ramanathan said. The NEHTA statement also features ACIITC member, Rod Young, explaining more about the Pathfinder Project, which will soon bring together three members of the vendor panel with three aged care providers, the names of which are expected be officially announced later this week. “The Pathfinder Project, which is being managed by the Aged Care Association Australia, will be working closely with several of the contracted vendors to develop a roadmap for future IT deployment in aged care, generate lessons learned from adopting the PCEHR standards, identify the ways in which aged care providers benefit from integrating with the PCEHR, and understand what business process changes will be required to maximise the benefits of PCEHR integration,” Mr Young said. Mr Ramanathan announced plans to pursue the Pathfinder Project at the Information Technology in Aged Care (ITAC) conference in April. In a “whole-of-industry approach”, he said the three providers would test out the PCEHR and “look at workflows, policy issues, then document it and disseminate it to the entire sector”. Mr Ramanathan also used the ITAC 2012 forum to invite chief information officers (CIOs) from aged care providers around Australia to join a national ‘CIO’s forum’ for the aged care industry, in order to develop a “national roadmap for greater IT implementation in aged care”. Good work Suri! Older people are a natural market for the PCeHR and aged care providers a natural marketing channel for this audience.